NM Jedi Knight is half Accoyo and possesses some of the densest fleece imaginable. His crimp, luster, and handle have to be seen and felt to be believed. A true 6Peruvian Accoyo Grand Triumph son, Jedi in turn is passing on his 'best stuff' to his own sons. 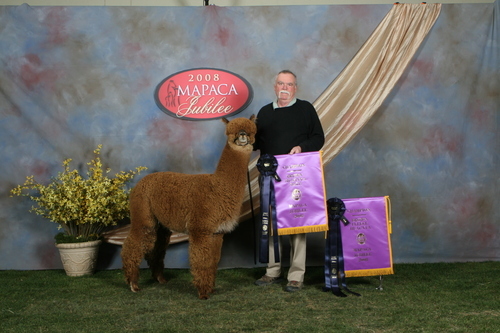 Nevada took Color Champion at the Big E in 2001 when she was just 8 months old! She is truly a beautiful girl. She's a little shy and she's as gentle an animal as anyone could ask for, a real little lady. As you can imagine, Nevada has great conformation, crimp, density, luster, covererage, and handle. During his own show career, Beethoven won 12 CHAMPIONSHIPS, with his wins representing the opinions of ten different judges. They all agreed that his strong & balanced bone structure, and his dense, bright fiber were deserving of his incredible string of championships. BEETHOVEN has the quality and prepotency that make him a true Impact Male. During his own show career, Beethoven won 12 CHAMPIONSHIPS, with his wins representing the opinions of ten different judges. They all agreed that his strong & balanced bone structure, and his dense, bright fiber were deserving of his incredible string of championships. 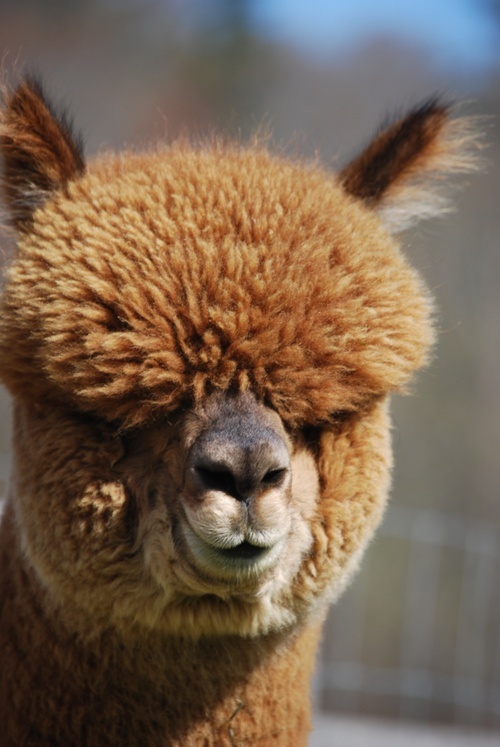 Beethoven stamps out his balanced frame, distinctive head, and fiber characteristics - time after time. 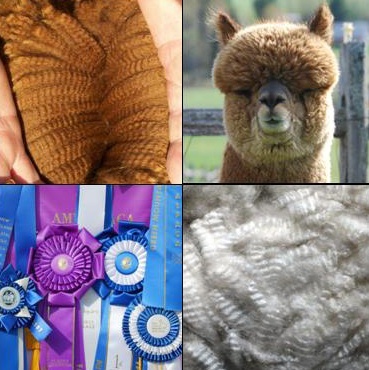 His offspring inherit his density and the consistency of fiber architecture which the judges comment on consistently. 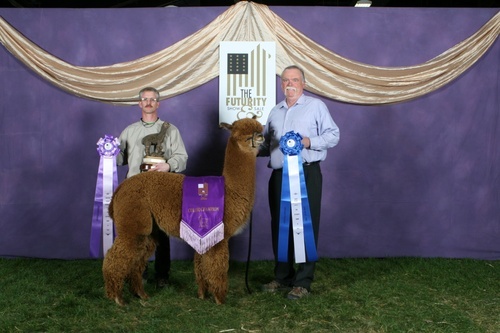 His Offspring ribbons total 269 - with 85 Blue Ribbons and 43 Championships. Beethoven's Dorian is a notable offspring who has also sired many Champions. 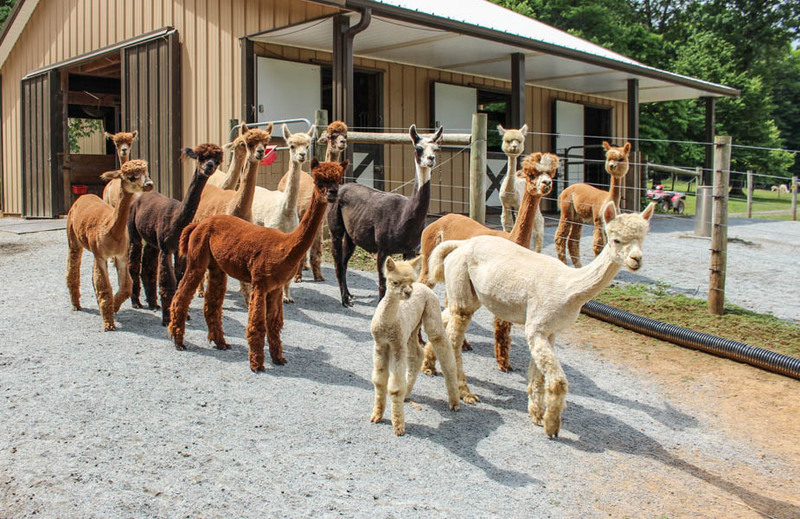 Beethoven is Owned by Highland Airs Alpaca Ranch and Leased by Sugartown Farms. Color Champion! 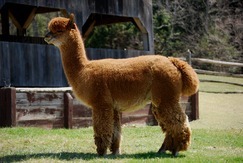 Halter, 2007 Green Mt Alpaca Fall Spect. Color Champion! 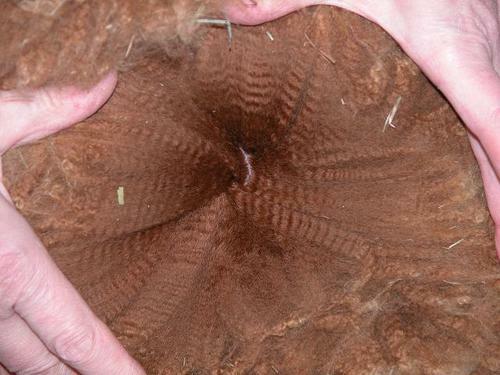 Fleece, 2007 Green Mt Alpaca Fall Spect.